Give your colleagues the soothing gift of relaxation this holiday season with CAREBOX’s Calmness in a Box. Give the gift of calm this holiday season with this luxurious package from CAREBOX! Self care is a critical part of our mental health routine and has the capability to change lives. Filled to the brim with organic lavender personal care items, this American made product is sure to bring a soothing, quiet evening to a stressful, busy life. 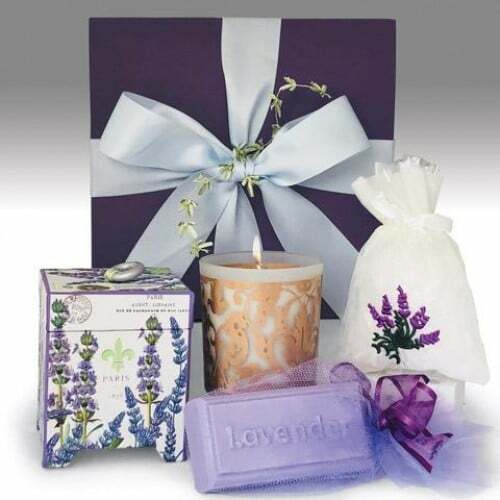 This product features a clean and beautifully wrapped lavender box tied tight with a satin bow. Inside, it includes all of the necessities for a relaxing bath. “Calmness in a box” makes a perfect office gift for colleagues during this stressful time of year. A lavender scented, moisturizing glycerin soap is carefully wrapped in lavender tulle and tied tightly with a purple French ribbon. Relaxing, organic bath salts are fused with essential oils and minerals, and secured in a beautifully embroidered bag. Finally, a handcrafted Michel Design Works candle made with lavender, rosemary, and eucalyptus is built with a decorative casing and packed neatly into a small ivory toned box decorated with floral graphics. To add that extra touch, CAREBOX partnered with Parisian illustrator Flowe Illustrations to include a uniquely designed postcard. The creation of this postcard is special because it was made by interpreting the story of a present and turning it into an image. When combined, these purposefully packaged items create the ultimate relaxing experience. They have truly mastered calmness in a box! Aromatherapy has been used for centuries for healing and mood management. Lavender, in particular, can be used to improve or alleviate symptoms of insomnia, colds, indigestion, infections, spasms, cramps, and high blood pressure. This organically based, essential oil powered care package is the perfect present for folks of all ages! CAREBOX is a San Francisco based company built on the notion of providing products that heal and nurture. Their product was born as a means to give in a way that makes people feel good after their creator spent time caring for her ailing parents. Many of the same products she used to care for them can be found in their products, such as soothing lavender. They are so confident that you will find the healing you deserve in their products, that they are thoughtful enough to include a 15% off discount to be applied to your first purchase with the code “THANKYOU15.” In addition, they offer free shipping on orders of $50 or more.